How does Saxenda for weight loss work? Saxenda(liraglutide) is a selective glucagon-like peptide-1 (GLP-1) receptor agonist type medication that was approved in December of 2014 in addition to diet and exercise for weight loss in those who are obese with a body mass index of 27 or more with a comborbid condition or those with a BMI of over 30. A lower dose of the same medication was approved in January 2010 as an adjunct to diet and exercise to improve glycemic control in adults with type 2 diabetes mellitus (T2DM) (tradename: Victoza). The maximum approved dose for the diabetes indication as Victoza is 1.8 mg daily, administered as a subcutaneous injection while the weight loss dose was 3.0 mg administered similarly. How effective is Saxenda for weight loss? In one clinical trial assessing the effectiveness and safety of Saxenda, patients had an average weight loss of 4.5 percent from baseline compared to treatment with a placebo (inactive pill) at one year. In this trial, 62 percent of patients treated with Saxenda lost at least 5 percent of their body weight compared with 34 percent of patients treated with placebo. In another clinical trial that enrolled patients with type 2 diabetes showed that patients had an average weight loss of 3.7 percent from baseline compared to treatment with placebo at one year. In this trial, 49 percent of patients treated with Saxenda lost at least 5 percent of their body weight compared with 16 percent of patients treated with placebo. Just like any of the other new weight loss medications, patients taking Saxenda for weight loss should be evaluated after 16 weeks to determine if the treatment is working. 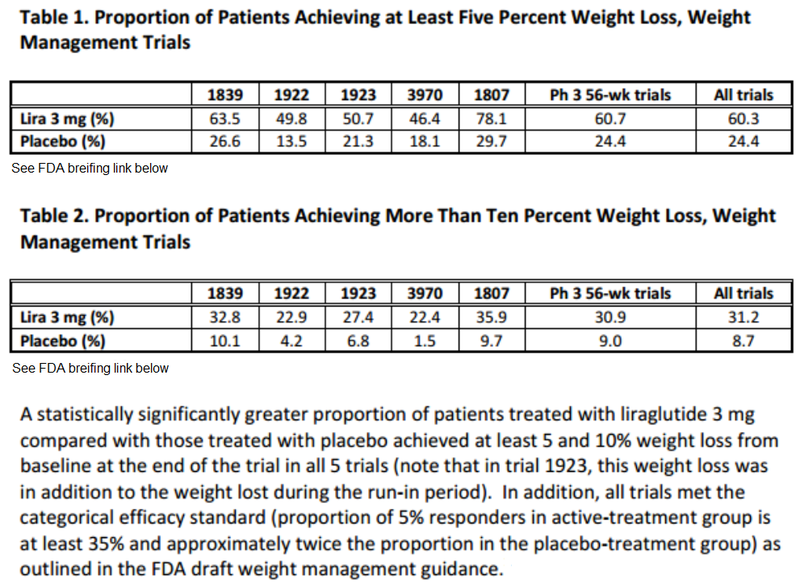 It is recommended that if a patient has not lost at least 4 percent of baseline body weight, Saxenda should be discontinued, as it is unlikely that the patient will achieve and sustain clinically meaningful weight loss with continued treatment. Although Saxenda is safe to take in non-diabetics, (in fact it is more effective for weight loss in non-diabetics than diabetics), the added benefit for prediabetics or diabetics is the fact that studies to date suggest liraglutide improves control of blood glucose. It reduces meal-related hyperglycemia (for 24 hours after administration) by increasing insulin secretion, delaying gastric emptying, and suppressing prandial glucagon secretion. Benefits of Saxenda over other weight loss drugs! It acts in a glucose-dependent manner, meaning it will stimulate insulin secretion only when blood glucose levels are higher than normal. Consequently, it shows negligible risk of hypoglycemia. It decreases appetite and maintains body weight, as shown in a head-to-head study versus glimepiride. Liraglutide is an acylated human glucagon-like peptide-1 (GLP-1) agonist, similar to human GLP-1(7-37), a less common form of endogenous GLP-1. Liraglutide leads to insulin release in pancreatic beta cells in the presence of elevated blood glucose. This insulin secretion subsides as glucose concentrations decrease and approach euglycemia. It also decreases glucagon secretion in a glucose-dependent manner and delays gastric emptying. Unlike native GLP-1, liraglutide is stable against metabolic degradation by peptidases with a plasma half-life of 13 hours. GLP-1, in its natural form, is short-lived in the body (the half-life after intramuscular injection is approximately half an hour), so it is not very useful as a therapeutic agent. However, liraglutide has a half-life after subcutaneous injection of 11–15 hours, making it suitable for once-daily dosing (less frequent than twice daily Byetta, but considerably more frequent than the once weekly Bydureon, which received approval from the FDA in January 2012). GLP-1(7-37) has a half-life of 1.5–2 minutes due to degradation by the ubiquitous enzymes, dipeptidyl peptidase IV (DPP-IV) and neutral endopeptidases (NEP). The prolonged action of liraglutide is achieved by attaching a fatty acid molecule at one position of the GLP-1 molecule, enabling it to bind to albumin within the subcutaneous tissue and bloodstream. The active GLP-1 is then released from albumin at a slow, consistent rate. Albumin binding also results in slower degradation and reduced renal elimination compared to GLP-1. 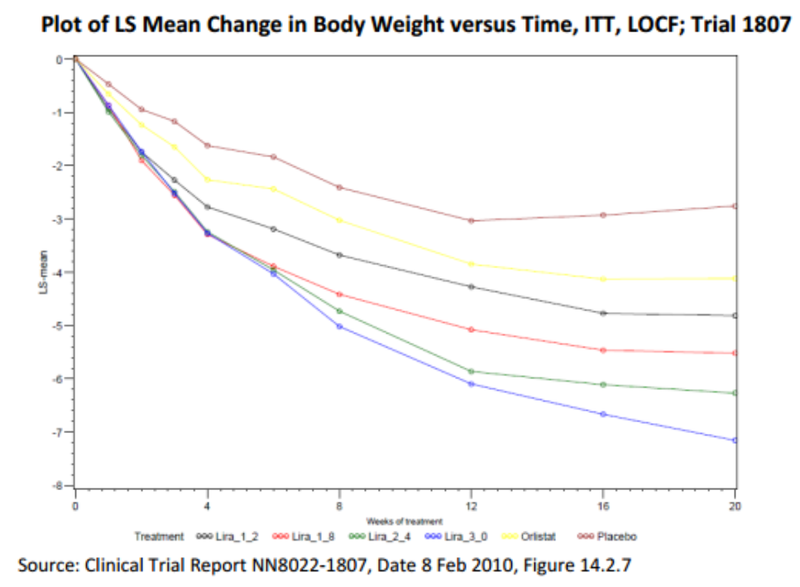 Because of the unique mechanism of action and relative success on the market as Victoza at a lower dose for diabetes, Saxenda is expected to generate a lot of interest among the patients, prescribing physicians and the investors alike and is projected to break through the barriers faced by the other new weight loss medications including Qsymia, Belviq, and Contrave according to Dr. Prab R. Tumpati, MD, founder of W8MD medical weight loss centers and a leading weight loss expert with offices in 3 many states including New York, New Jersey and Pennsylvania. Liraglutide is marketed under the brandname Saxenda for weight loss and Victoza for diabetes in the U.S.
W8MD Medical Weight Loss Centers of America is one of the first weight loss centers in America to start offering Saxenda to eligible patients to help fight the epidemic of obesity, and over 50 metabolic and health problems that are associated with obesity! NYC Insurance Weight Loss Center: 2003, Bath Avenue, Brooklyn, NY, 11214 Ph: 1-718-946-5500. W8MD’s affordable and delicious meal replacements start as low as $2.25 for each meal replaced and have been shown to not only help people lose weight but also save up to 15% on monthly grocery bills in an internal study! As W8MD remains the only medical weight loss program in the area to work with health insurance for the weight loss physician visits, the demand is high and acceptance is limited, so call 1-800-W8MD-007 to make your appointment now or to learn more. He is a very good listener and takes time with you. He never rushes you like some doctors. His office appears to be hi tech also very clean.- Thomas C.
Excellent doctor, very thorough, knowledgeable, and caring. I’ve been fighting obesity for years with little or no result, and now my waistline is melting, and I feel great! I highly recommend Dr. Tumpati to everyone who wants a chance to a new life. – verified patient.